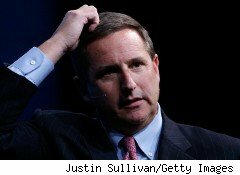 Mark Hurd will receive an annual salary of $950,000 and a bonus of as much as $10 million for fiscal 2011 in his new position as president of Oracle (ORCL), according to a regulatory filing. Hurd, who resigned as CEO of Hewlett-Packard (HPQ) last month over allegations of falsified expense claims, will also have the option to buy 10 million shares in Oracle, and a further 5 million shares in each of the next five years. Hurd's total compensation from HP was $24.2 million in 2009, The San Francisco Chronicle reported. Of course, if Hurd were to rise to become the next CEO of Oracle, replacing Larry Ellison, he could earn more than in his HP days. As CEO of HP, Hurd more than tripled the company's profit and expanded the business with acquisitions worth more than $20 billion.